Alex Wang, an agent at the San Francisco Bay Area brokerage Sereno Group, made it easy for a recent buyer client to dream up ways to remodel his new home by giving him a floor plan and interactive 3-D model. The client used the model to get a handle on the dimensions of rooms and virtually switch around the home’s furniture and color scheme. “They were able to use the floor plan to talk with the designer without having to measure out the house … and just speaking over the phone,” Wang said of his buyer, a Google employee who had purchased a $1.8 million listing in Saratoga, California. Next-generation visual representations are gaining traction in real estate, helping some agents win listings and prequalify buyers. But the Sereno Group’s partnership with 3-D tech provider InsideMaps points to another benefit for agents: helping them maintain a strong connection with past clients. Sereno Group agents like Wang are providing agent-branded floor plans and interactive 3-D models to buyer clients, hoping to stay top of mind when clients virtually remodel and decorate homes after purchasing them. “I think it’s a tremendous benefit to the Sereno agent because it gives them a marketing tool that lives beyond thank-you cards or other mailings,” said Joe Kilmer, marketing strategist at Sereno Group. InsideMaps’ offering is one of the latest 3-D products to hit the market. Other 3-D providers include Matterport, Floored, Planitar and DIAKRIT. According to InsideMaps CEO George Bolanos, InsideMaps stands out from other providers because it bundles multiple visual representations into a low-cost, full-service offering. For $199, InsideMaps sends a partner photographer to shoot photos and take floor measurements of a listing. The firm then renders all of that into a branded interactive 3-D model, branded floor plans and branded listing photos. Sereno Group CEO Chris Trapani sees the InsideMaps product as a listing tool that agents can use to attract seller clients and give prospective buyers searching online a better idea of whether a home is right for them. But Sereno Group, which claims to have closed over $2.1 billion in 2013 sales with an average price of $1 million, also believes its agents can leverage the product to stay top of mind with past clients, he said. Homeowners can use the models to virtually add and manipulate furniture in their homes as well switch around the paint colors of floors and walls. Paired with floor plans, 3-D tools enable homeowners to cook up remodeling and redecorating projects, and perhaps even help them get rough bids on projects from architects, interior designers and contractors. It’s easy to imagine homeowners using the 3-D models and floor plans throughout their stay in a home, and stirring up memories of their real estate agent in the process — particularly since the models are branded with their former agent’s mug shot and contact information. That’s one reason Sereno Group decided to partner with InsideMaps instead of Matterport, the leading provider of 3-D models to real estate agents. Another is that InsideMaps produces the models for Sereno Group, rather than requiring the broker to purchase an expensive camera or hire a third-party marketing firm familiar with 3-D hardware. “We were looking more for a turnkey solution that wouldn’t be cost-prohibitive,” Trapani said. Real estate marketers may be quick to adopt InsideMaps, since its models can be produced using a standard SLR camera. Marketers who want to offer Matterport models to clients must buy and learn to use its $5,000 camera. Photographers have to shoot between 12 and 16 photos of a room to capture enough area for InsideMaps’ software to stitch the shots into an interactive 3-D space. For now, Matterport doesn’t currently offer agent-branded models, floor plans or virtual staging capabilities, but the company is working on those features. What may make up for all of that, however, is the realism of Matterport’s models, which look much more lifelike than those offered by InsideMaps. That’s because, unlike InsideMaps, Matterport projects photos onto its models. As Matterport plugs away at developing features that could match InsideMaps’ offering, InsideMaps is developing models that it hopes will match the photo-realism of Matterport’s. In January, InsideMaps will add photo-realistic models to its 3-D product for no extra cost, Bolanos said. The photo-realistic models will supplement InsideMaps’ current interactive 3-D models, not replace them. 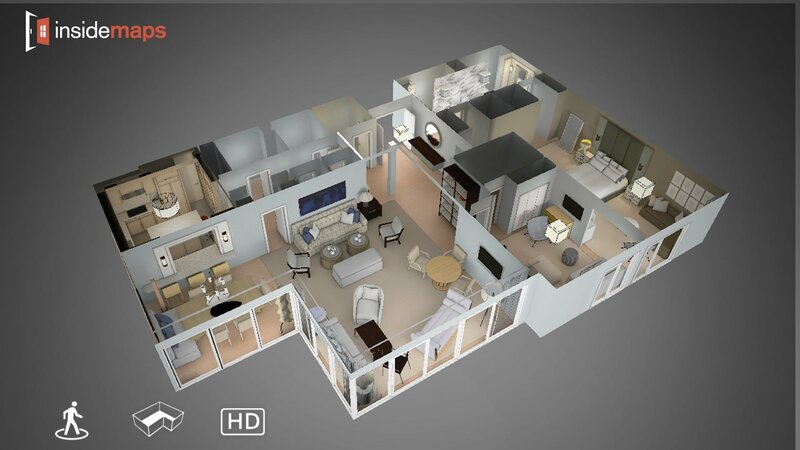 Users will only be able to manipulate furniture and color schemes using InsideMaps’ current interactive 3-D models. “The 3-D models are great, they’re interactive, but sometimes Realtors want the high-quality photography projected on a 3-D model and we understand that,” Bolanos said. If you are reading this article on a desktop computer or iPhone or iPad that runs on iOS 8, you can click the image below to play around with an InsideMaps 3-D model. You may have to wait a bit for the model to load. Article image credited to An InsideMaps interactive 3-D model displayed on an iPad.